In January 2011 I was in Scotland, trying to follow South Sudan’s independence referendum from afar. Today I am in Somalia, trying to follow the Scotland’s independence referendum from afar. Life is very odd. Despite the many parallels that my South Sudanese and Somali friends try to draw with the Scottish referendum (“go for independence!” they urge. “Free yourselves!” In Nigeria the other week, a man told me: “I want Scotland to vote for independence, because Great Britain divided Africa, and now it should be divided”), there are of course enormous differences, the biggest – from my perspective right now – being that no one has any idea how this one is going to go. The results of the South Sudanese referendum were a foregone conclusion from as early as 2006 or 2007, no matter how much the Khartoum Government was urged to ‘make unity attractive’; the Scottish referendum, on the other hand, is anyone’s guess. If you’d asked me six months ago I would have definitely said that the No vote would win with some degree of ease; the last month or two I’ve become far less certain, and today all the polls are predicting different results. Having just heard from a friend whom I was certain would vote No and who in fact voted Yes, I think that’s where my money is, but really, who knows? I think there are a lot of people who are playing their cards very close to their chest on this one: lone No voters in Yes families, and vice versa – but there are also people who genuinely have been unable to make up their mind until the last minute. As a resident of Scotland, I was eligible for a vote, but I didn’t register in time for a postal vote, and thus haven’t voted. I feel both ashamed and OK about this: on one hand, I have very much internalised the idea of using one’s democratic rights as much as possible; on the other hand, I have a vague, waffy feeling that it’s somehow more ethically correct for me to sit this one out, as an English person who has chosen to settle in Scotland but who has been primarily abroad for the past several years – let the real residents decide. I confess, also, that on a subconscious level, I put off registering until too late because I just could not decide. I’ve had many (many, many) conversations with friends about this over the past couple of years, and I’ve been Definitely Yes and Definitely No and until a few days ago I was Definitely Not Sure. 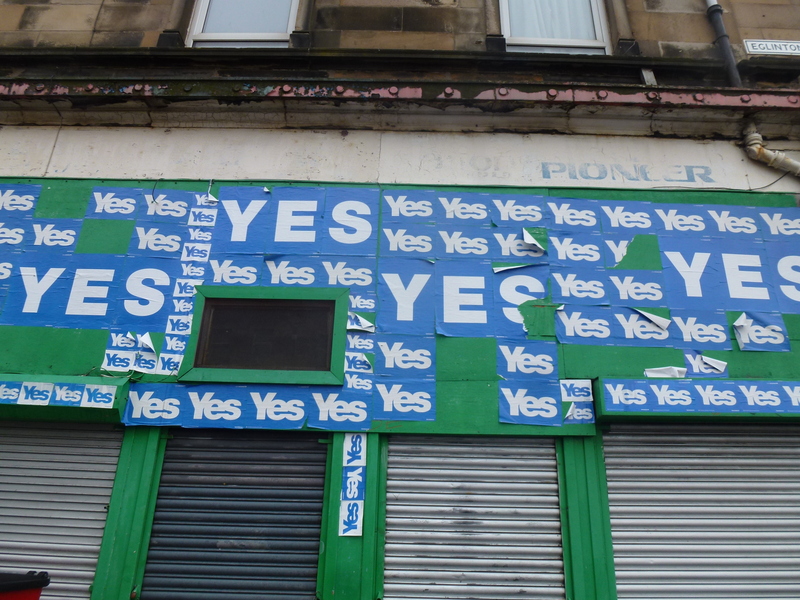 And then I realised this morning that if the Yes campaign lost by a single vote (i.e. mine) I would feel guilty, whereas if the No campaign lost by a single vote, I would feel OK with it. Which I suppose is as good an indication as any of where my inclination lies.